Where do I even begin when it comes to discussing No Ordinary Marriage , by Tim Savage? This is another new release from Crossway Books and I have to confess to rolling my eyes a bit and thinking, "Oh, another marriage book." Publishers do seem to be poppin' out books on the topic left and right but this is Crossway and if you are a regular around here, you know I rather like this publishing company and so I was perfectly happy giving it a go. And I am oh. so. glad. I did. Recently I let it be known around here that I have a set of favorite books on marriage. I keep meaning to write up a post sharing what those specific titles are and I still mean to. Whenever I get around to writing up that list, this title will be on it. Like my other favorites, No Ordinary Marriage gets right to the heart of the matter when it comes to how to approach and work on a marriage. 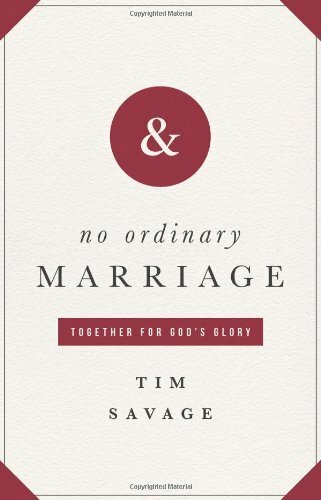 The subtitle to this book is "Together for the Glory of God" and Savage's goal is to point out that marriage is designed to reflect and showcase the glory of God. He promptly gets right in the reader's face and deals with the greatest threat towards marriage: self-centeredness. The marriage, while enjoyed by two individuals, is not about them. They are enjoying a gift that God designed perfectly to display His glory. Therefore it is our duty and responsibility to set aside our own selfish pride and feelings of entitlement so that we can selflessly reflect God's love to one another and then to the whole world. Kindly, God has designed it so that at the same time a good marriage is reflecting God's glory, it is also benefiting and providing pleasure to the individuals involved within it. Now, I do have to pause here and say that I thought Savage wasn't always as clear as he could have been in saying that a married couple cannot possess God's glory. Throughout the reading of the book I understood Savage was not saying that we can personally own God's glory but that we merely reflect it. However, I do wish he had said distinctly and right up front because I spent the first few chapters wondering exactly where he was going with this. But he is very clear about making that distinction over time. The main thing, as I've mentioned, that Savage hammers away at is the sin of self-centeredness for each individual in the marriage. It's so easy for me, personally, to focus on my own thoughts and emotions and I'm very quick to dismiss what Jonathan is feeling or needing in any given moment. I'm more inclined to satisfy myself. I want to sleep in later, wash fewer dishes and have time to myself to pursue the things I want to pursue. But if I am committed to Jonathan - or, more importantly, to the Lord - then I should repent of this sinful attitude of self-gratification. It is important that I set what I think would make me happy aside in favor of honoring the Lord by practically honoring my husband. This isn't easy and Savage doesn't try and pretend that it is. On the contrary, he harps about the need to set aside self because he rightly believes that it is this devotion and worship of self that is the single greatest destructive force to a marriage. The moment you decide that you "deserve" to be happy above everyone and anything else, your marriage is on the rocks and is not accurately reflecting the sacrificial love of God. Savage is also aware of, and makes no excuses for, the fact that two individuals have to work very hard, not just to set aside their individual wants but to work together in an effort to build and maintain unity. Just because you marry someone doesn't mean you agree with everything that they think. You should never enter a marriage assuming that you have met your perfect match who agrees with you explicitly and implicitly about every single topic in the known universe. Chances are, you will marry someone who is distinctly different from yourself and you will encounter some hardships in your marriage. Savage said that these times of disagreement and disunity should not frighten or worry us. They are on the cusp of victory, that is, if they turn their eyes heavenward and pray that God will intervene in their marriage and grant them wisdom and grace to rise and meet the unique challenges which they are presented with. One cannot ask for help from the Lord without a bit (ha!) of humility and a conscious willingness to deal with sin and make some changes. Savage dutifully points all of this out as well. And what happens with a marriage that is devoted to showcasing the glory of God? Everyone, not just the partners within the marriage, benefits. The church benefits, the family does, and so does the rest of society. Of course, all of the above is as relates to a Christian marriage which Savage believes is sacred and to be greatly desired. I love that he devotes a chapter to singles (while also stating he didn't like the term "single" because that is exactly what they aren't!). In this chapter he spells out the following: a.) "Singlehood" is a gift which should not be relinquished in a hasty fashion. While single you are free to serve the Lord single-heartedly and that is a good thing. b.) You should take care to marry someone who is single-minded in their love of Christ. It absolutely will not be of any benefit to marry someone who is not passionate about the Lord or the pursuit of holiness. In fact, it will be a great detriment for you to marry someone who is not passionate about God. I know I've included a lot of quotes here, but I don't want to forget any of these! I really appreciated how Savage exhorts his reader to consider their potential for a relationship, or the relationship that they are currently in, as reflecting the glory of God. If we take our eyes off ourselves for a moment and realize that God is telling a bigger story and that our lives are but small pieces in His much larger and grand design, how much better off we'd be! I like that Savage doesn't offer a step-by-step guide for how to improve your marriage. Mostly he says there is one "simple" step: you must die to self. Sacrificial love is what God has given to us and what He reflects through us - all for His glory, and His alone. I hardly feel as if I'm doing this book a lick of justice but I do highly recommend it because he spends the whole of his time talking about what really matters in a marriage - and it turns out not to be me! Who'd have thunk it?! Thanks, Crossway Books, for shooting a copy of this book my direction in exchange for my honest thoughts. It's nice to see a book that gets to the heart of the issue: selfishness. Too many books, secular and sacred, follow the "get-rich-quick" pattern, and try to sell a particular formula, when a true marriage is never a formula. I almost reviewed that, but chose Marriage and the Family instead. Also liked it! PS...added it to my list of books to read and own. Sounds good. Unselfishness seems to be the key to most relationships. Sounds like a good resource. My favorite marriage book is the Ministry of Marriage by Jim Binney. I try to keep a list of highly recommended marriage books. This one is going on there! I think I recall you recommending "Reforming Marriage". I got it recently, and hope to get to it soon. Thanks for this review. Eric and I just decided to read The Meaning of Marriage by Tim Keller. I read an excerpt in Thriving Family magazine, and thought it was very insightful. Sounds like another good one, Carrie. I like the way this guy thinks.